I am wearing my own costume; Silenny Mejia. My idea came from last Halloween when I was shopping for this year’s costume on Sale. I found a huge bow without the arrows so it cost like 7$ and it looked just like the one from Avatar movie. 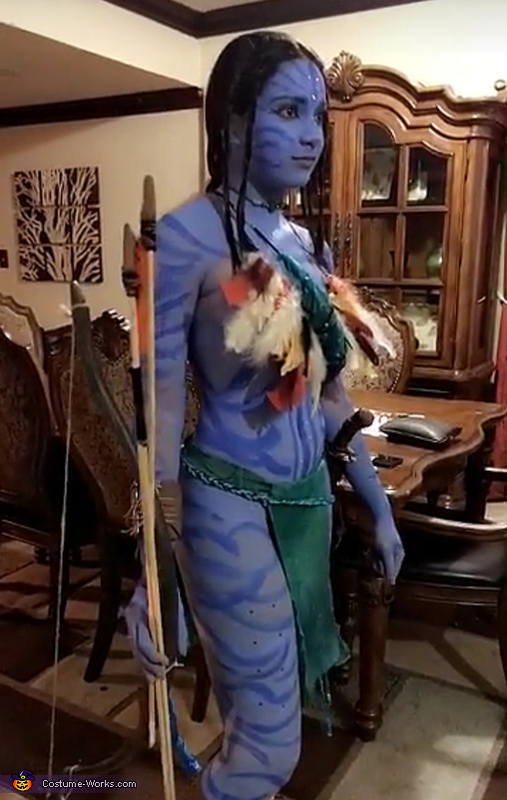 So, since I love avatar and I was planning ahead of time, I decided that I can make it all at home to try and make an exact replica of Neytiri. Basically everything I wore I made except for the bow that I bought. And of course the sandals which were 25$. I made the take from a long piece of wire, then wrapped newspaper around it with tape. I painted it a light blew, then a darker blue for the stripes, put rhynestones and a piece of a black boa scarf at the end. The skirt I bought the fabric at Jo-Anne’s, I cut 2 pieces one for the front and the back, and sewed them to another strip of fabric that I tied in the sides almost like a belt. The chest piece was almost like a necklace. I glued yellow, orange, red, black, and tan feathers to a leather string and made it like a necklace. The belt I braided blue leather string and out some beads on it with a hook at the end. I made the arrows by purchasing three sticks, and with clay I made the arrow tips. I used about 20 oz of blue and white paint mixed for my entire body. I used long black hair extensions to make a bread in the back. I bought a fake plastic knife and put clay, leather string, and a bunch of other things that would make it look like Neytiri,s knife. Lastly the bracelets, and any jewelry she had I made my self with beads and elastic string, as well as the necklace. In total, I spent about 130-150$ on all the materials.